"Never let anger destroy your heart." Retired FDNY fireman John Bartlett and Sergeant Conor McDonald, NYPD, opened the 2018 New York Encounter with conversation. 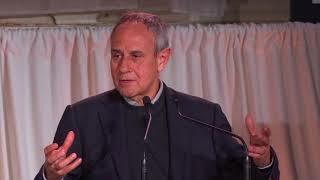 New York Encounter - The Presentation on "The Life of Luigi Giussani"
Witnesses by Alberto Savorana, Fr. Julián Carrón, Fr. Pigi Bernareggi, Pier Alberto Bertazzi, Rose Busingye, Jonathan Fields, Shodo Habukawa and Margaret Stokman. The translation of the biography of the founder of CL is now available. "Dorothy Day’s life embodied a sense of odyssey marked by constant conversion of heart, intimacy with Jesus Christ and a holistic approach to all things, Cardinal Dolan said." "We try to pinpoint something that is urgent, burning, hurting or even a source of hope." Christopher White recapitulated the 2018 New York Encounter's highlights. Abbé Claude's parish is literally the streets of Montreal, where he and his adopted son, Kevin (who also used to live on the streets), minister to his flock: the homeless people of Montreal. NY Encounter: "...felt like an absolute feast"
"Reality as it is given in the present moment is the place in which the promise of eternity reveals itself." Marcie Stokman, founder of Well-Read Mom, and Dr. James Como spoke about "The Screwtape Letters" by C.S. Lewis at the 2017 New York Encounter. Recovering a friendly relationship with food and the experience of eating at the 2017 New York Encounter. A conversation with the Rev. Samuel Fontana, José Porro, Ginny Laracy and Karen Le Billon. "Healing is about teaching people to love — themselves and others." Stories of reconciliation with life with Dan Jusino and Tommaso Bardelli at the 2017 New York Encounter. The Rev. Tom Colucci, a firefighter during the horrors of September 11, 2001, gave a witness at the 2017 New York Encounter of that unforgettable day, the work that followed and the concrete signs of Christ throughout it all. The New York Encounter: Why? I wrote for "Traces" again this New York Encounter but in the middle of it I wondered whether I had made a mistake. I enjoy writing but it is always slog. "What are we missing? Why do we often perceive reality as disappointing? What can help us reconcile with reality and engage life as it is?" The 2017 New York Encounter opened with music and a conversation with Richard Cabral and Fr. Vincent Nagle. Monica Goodwin, Mila Villaceran and Anthony Lechich discuss the impact of the elder generations at the 2017 New York Encounter. "Our faith must become a lived beauty through which others can encounter God’s incredible love." Fr. Julián Carrón discussed his new book "Disarming Beauty" with Joseph Weiler at the 2017 New York Encounter. David Brooks and R. R. Reno discussed the question, “Are the American People Betraying Their Dream? Or Is the American Dream Betraying its People?" at the 2017 New York Encounter. "The goal of Christianity is not to win an argument, but to be holy." Cardinal Timothy Dolan, the Rev. Matt Malone and Claire Vouk conversed on the American saints' exhibit “The American Dream Come True” at the 2017 New York Encounter. "The problem with man making himself dissimilar to God is that it also makes him dissimilar to himself." A conversation on the 2017 New York Encounter theme with Michael Waldstein, John Waters and Fr. José Medina. What does it mean to be successful in research? What drives their work? Can the work of the scientist be viewed as an art form? A conversation at the 2017 New York Encounter with Maria Teresa Landi, Polly Matzinger and Luca Matone.